In the Seven Years War the British alliance cost Hessen dearly. In 1756 the French army under Richelieu broke into Germany, and, defeating the Duke of Cumberland at Hastenbeck, occupied Hessen, making it a theatre of war for the succeeding five campaigns. The French imposed heavy contributions. A tribute of 850,000 talers was demanded in 1757 in an attempt to break the alliance with Britain. Since this failed of its purpose, 500,000 more were demanded each year from 1759 to 1761. A smaller sum was levied in 1762. In addition the French requisitioned grain for their soldiers and hay for their animals. Both the main towns, Kassel and Marburg, were besieged, taken, and retaken many times. Marburg's famous Elisabethkirche, a centre of pilgrimage before the Reformation, was used as a granary by the occupying French army. The ancient town changed hands fifteen times, the castle on the heights above, seven times. The Hessian corps fought throughout the campaigns of the Seven Years War. Ferdinand of Brunswick, commander of 'His Britannic Majesty's Army in Germany', regarded them as more able to withstand the hardships of war than any other contingent. Despite its name this army contained more Hannoverians and Hessians than British troops, who only appeared in September, 1758. 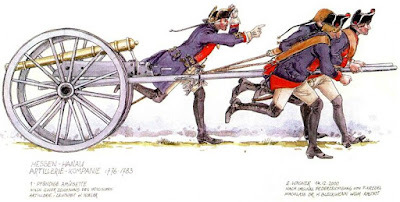 Of total strength in 1760 of 90,000, some 37,800 were Hannoverians, 24,400 Hessians, 22,000 British, 9,500 Brunswickers, and there were some lesser contingents. Yet it succeeded in tying down double its number of French troops, a service of inestimable value both to British conquests overseas and to Frederick of Prussia in his struggle against a European coalition. When Frederick heard of the conclusion of an Anglo-Hessian subsidy treaty for additional men in early 1759 he wrote to his minister in London, 'C'est avec bien de la satisfaction que j'ai appris par votre rapport ordinaire du 16 de ce mois la conclusion du nouveau traite de subside avec le cour de Hesse.' In both 1759 and 1778 Frederick regarded Hessen-Kassel as having an essential role in the defence of his western flank. With the fighting going on in Hessen, Hessian soldiers were sorely tempted to make off home to see how wives and sweethearts, or livestock and crops, were faring. In 1762 some 111 cavalry and 2,196 infantrymen deserted out of a contingent of 24,000. The strain of maintaining this large corps fell heavily on the small state. By August 1761 the Landgraf informed Colonel Clavering, British representative at his court, that it would be impracticable to get more recruits if the war continued for another year. Recruiting officers sent to Hamburg, Lübeck and Bremen picked up only deserters and vagabonds, who were no sooner enlisted than they deserted again. The corps could hardly be kept up to strength until the Landgraf was once again master of his own country. Hessian subalterns and rank and file for the last campaign were sixteen- and seven teen-year-olds. This mainly German army, by tying down French strength, enabled Britain to conquer her first empire overseas. British subsidies were well spent. By contrast the French who paid for the Duke of Württemberg's corps to serve with the Imperial Army against Prussia got a rabble. Duke Karl Eugen had introduced Prussian recruiting methods to enlist his troops, and in spring and summer of 1757 thousands of young men were forcibly pressed into service. Badly trained and brutally treated, they deserted in droves and were routed by Frederick of Prussia at Leuthen. Only about 1,900 of some 6,000 returned to Württemberg months later. to the use of formidable weapons; so when he has reached the size necessary to take a place in the valiant ranks, he is quickly formed into a soldier. The people of this country are numerous and warlike, being disciplin'd and train'd, perhaps more than what is for the good of the Country. The Prince might employ them a great deal better in making them labour the ground, and take to useful trades. The Landgrafs would have denied this. The army was the country's greatest source of revenue, its 'Peru' as Wilhelm VIII called it. Although the chief tax in Hessen was the military Kontribution, internal revenues alone could not pay for such forces. Kriegskasse accounts for 1742, a good year for subsidies but one in which a corps had to be maintained in the field, show that without subsidies from Britain of 933,000 talers, the state would have had a deficit of 445,000. With those subsidies it had a surplus even greater, 488,000 talers. In the years from 1730 to. 1750 the subsidy payments totalled some 8.3 million talers (£1.25 millions). The total revenue in taxes in that period was not much over 20 million talers. Despite the country's warlike constitution, the transition from the old-fashioned levy of armed men to a modern state army, financed by taxes collected by bureaucrats and recruited systematically, was only gradual. Throughout the first half of the eighteenth century, the old duties of the Hessian farmer to quarter both horse and man and to provide them with sustenance were commuted into cash payments which were used to build barracks. The requirement to provide horses and wagons for the army's train also became a cash duty called Heerwagengelder. The obligation to provide haulage for the transport, Vorspanndienst, was only reckoned as a set payment after it proved too much of a burden in the Seven Years War. 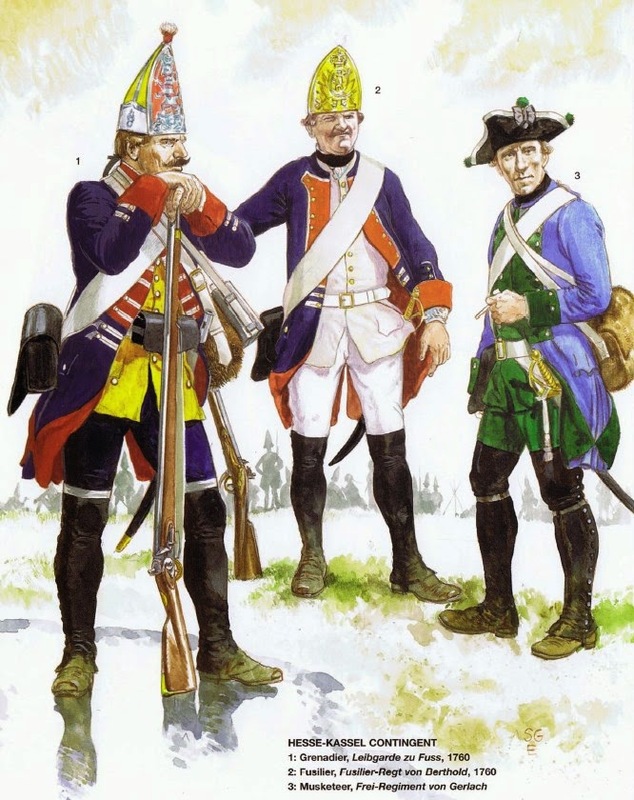 After this war Hessian troops were supplied for the first time, not directly by farmers in kind, but by magazines erected on the model of the French ones seen in Hessen.